I felt really sorry for the director of THE WHITE HAIRED WITCH OF LUNAR KINGDOM, who was in the audience for this screening at the LFF. In his own country, this film must be seen as a stunning and lavish depiction of earnest myth - much in the way that the LORD OF THE RINGS films might be watched here. But to Western eyes and ears, while much of the costume design and martial arts was fantastic, some of the hokey dialogue (no doubt not helped by poor translation) as well as the cursory if not arbitrary way in which plot is handled, was at times laugh out loud funny. It's the big budget lavish version of watching that old MONKEY TV show where everything is just ridiculous and entrancing at the same time. 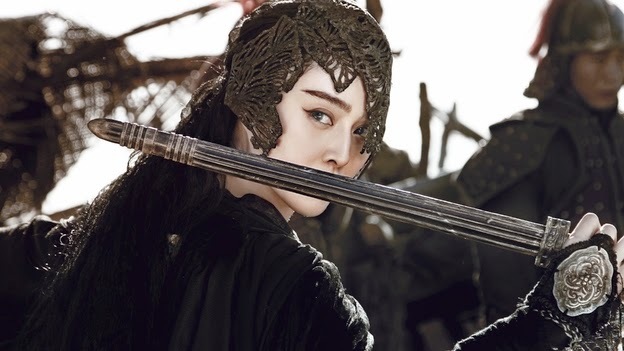 So the movie is based on Liang Yusheng’s apparently classic novel ‘Baifa Monü Zhuan’ and stars Fan BingBing (a massive star in China) as the White Haired Witch of the title. She's an awesome warrior and called Jade Raksha who stands against the corrupt rulers of the late Ming dynasty and finds her reputation and fortress under threat from armed factions too numerous to keep a track off. When the movie sticks to beautifully choreographed fight scenes it's impossible not to love it. But when it switches into high romance, it simply loses its grip on us. And there were so many armies showing up seemingly at the snap of a finger, and plot twists on a hairpin, I pretty much lost interest after the first half hour. THE WHITE HAIRED WITCH OF LUNAR KINGDOM has a running time of 103 minutes. It opened earlier this year in China, Vietnam, Hong Kong, Singapore and Cambodia.